Greater visibility, extra 15″ wide compartments and provides high air flow. National Mailboxes’ extra wide vented lockers offer visibility and provide abundant air flow as well as high security. These vented type lockers are perfect for locker rooms, athletic clubs and dressing room environments. Our extra wide vented lockers are offered in tan or grey finish and come as unassembled and assembled units. 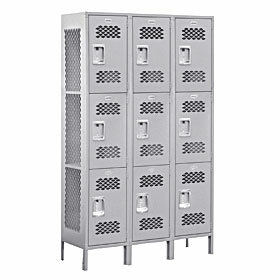 These heavy duty extra wide vented lockers are 15″ wide and have an overall height of six feet (+ 6″ for legs). Single tier extra wide vented lockers come with an adjustable top shelf and the 18″ deep extra wide single tier lockers also feature a jacket rod. Extra wide vented lockers come with three wall hooks.